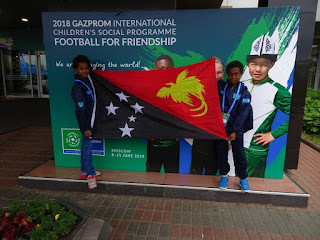 Young football player Justus Joseph, alongside a young aspiring journalist, Bethany Pakakota, have both departed the shores of Papua New Guinea for Moscow last Friday, Russia for this year’s Football for Friendship Programme put together by Gazprom in conjunction with world football governing body, FIFA. F4F is an international children’s social programme organised by Gazprom, an international company supporting global social projects and setting new standards in relation to social policy. Young Joseph is representing the Papua New Guinea as a football player, while Young Pakakota is attending as a young journalist. They are both excited and grateful for this amazing opportunity of a lifetime. “I am very flattered to be given this opportunity to travel to another country,” said Joseph. “I’m very excited to meet kids from around the world and enjoy playing football with them and to meet famous football players, but what excites me the most about this trip is the experience I will be having of something new and big.” Joseph added. “I am very lucky to have the chance to participate in the Football for Friendship programme. Their core values mean a lot to me, especially equality, fairness and victory. No one can live in harmony without sharing them! I'm also happy to see Russia for the first time and meet new friends which help develop my skills," said Young Journalist Berthany Pakakota. Joseph and Pakakota joins 211 countries and regions in the F4F programme, which translates to 3700 people aged between 12 to 16 years old having participated in the programme over the past five years. The program aims at developing youth football by championing youth sport and a healthy lifestyle, promoting friendship between children from different countries, fostering social values such as respect for other cultures and nations, and commitment to principles of equality in the younger generation. It is also comprised of several global events like the Annual International Children’s Football for Friendship Forum and International Day of Football Friendship, Football for Friendship World Championship, as well as numerous local sports and public events in participating countries. Thousands of children meet at these events, communicate, share their experiences, make friends, learn to find common language and understand each other.